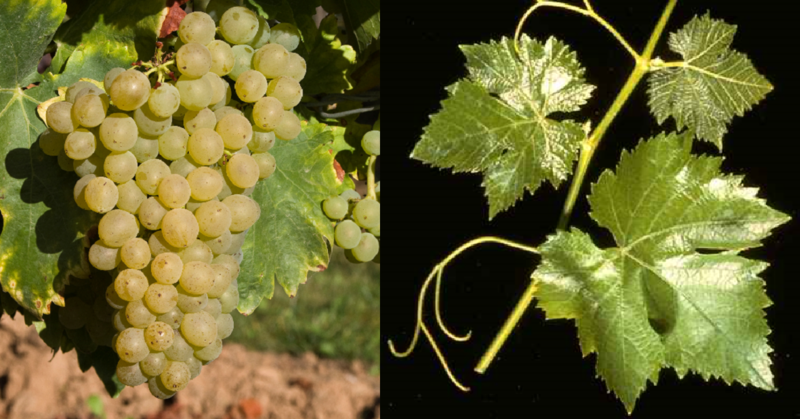 The white grape comes from Spain and belongs to the group of Garnacha varieties (see there General and Descent). Synonyms grouped alphabetically by country are Grenache Blanc, Rool Grenache, Silla Blanc, Sillina Lanc ( France ); Alicante Belyi, Gkrenas Mplan, Grenash Beli, Grenash Belyi, Grenash Bjal (former Yugoslavia ); Belan, Belon Croatia. Northern Macedonia ); Alicante Blanca, Bernacha Blanca, Garnacha, Garnacho Blanco, Garnatxa, Garnatxa Blanca, Lladanor Blanca, Sillina Lanc ( Spain ); Fehér Grenache ( Hungary ). It is a color mutation from Garnacha Tinta with yellow-green berries. According to DNA analysis it is not identical to the varieties of Granaccia (synonym of Vernaccia di Oristano ) and the no longer cultivated Cannonau Bianco (the red Cannonau is identical to Garnacha Tinta). The vine, which matures slightly earlier than Garnacha Tinta, has similar characteristics but is less susceptible to Verrieseln, The berries often have characteristic red color speckles. The variety yields extract- and alcohol-rich white wines with low acidity and floral notes oxidation tend. In Spain it is cultivated mainly in the northeast and is there in the DO areas Alella. Calatayud. Costers del Segre. Navarra. Priorato. Rioja. Tarragona and Terra Alta authorized. In 2010, it occupied a total of 2,263 hectares of vineyards in Spain with a strong downward trend (ten years earlier, there were 4,333 hectares). In France it is called Grenache Blanc in the south of the Mediterranean coast especially in the Roussillon up to the south Rhone in 2010, where it occupied a total of 5,004 hectares. Here she is for the production of Vin doux naturels in the fields of Banyuls. Maury. Rasteau and Rivesaltes used. She is also in white Châteauneuf-du-Pape authorized. Smaller stocks are also available in Croatia (24 ha), South Africa (46 ha) and United States in California (61 ha). The variety occupied in 2010 a total of 7,398 hectares of vineyards with decreasing trend (ten years earlier it was 10,821 hectares). It was thus worldwide varieties ranking on rank 90. This page was last modified at 4 April 2019 at 08:59.